Jon was born in Atlanta, Georgia but grew up in Chicago, Illinois. Art has been Jon's lifelong passion and Jon has been a professional artist since 1991. After graduating from an art college in New Jersey, and living in the New York area at the time, Jon worked primarily in commercial art as a comic book inker for companies such as Marvel and DC Comics. Jon worked on X-Men, Batman, Flash, Wonder Woman, Justice League, Deadpool, and many more. Jon also spent one year in 1990 working as a computer animator. Feeling somewhat restless in commercial art, Jon made the switch to fine art in 2005. He ditched the pen and paper and picked up the brush and canvas. He moved to Colorado to explore and paint the beautiful U.S. Western landscape. Jon paints to share his experiences with nature. Sometimes it is a subtle breeze on prairie grasses and sometimes it is snow in the mountains. 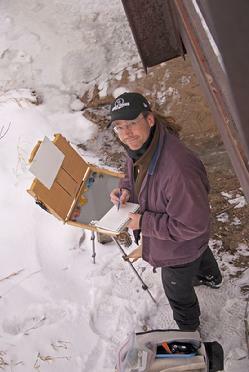 Jon works mostly in plein air oil paintings, but can be found in the studio as well. There is a never ending supply of experiences in the American west that should keep Jon happy for many years to come!